Be sure to advertise your auction to your buyers on your website or blog! Don't just rely on having your auction in DPW to attract buyers. Its always good set up a new post with a link to the auction in your blog, if you have one, or on your website, when you create your auction. 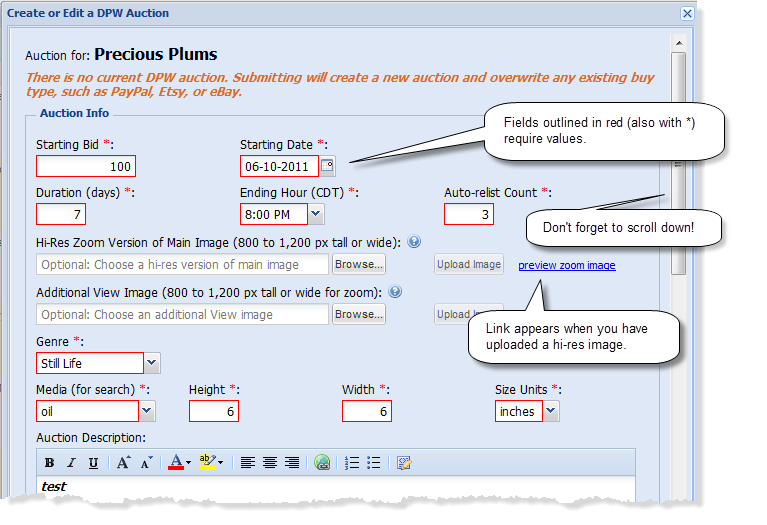 In fact, you should include your DPW Auction link wherever you show your work! This way, your buyers who follow you, will know where to go to buy your painting. Read this help article on how to create and pull a post, and then get the DPW Auction URL to put back in the post. Step 1. Click the Create/Edit Auction Icon in the left-most Task grid column. If you already have a DPW Auction for the painting, this icon will have a little pencil in place of the plus sign and clicking it will allow you to edit the existing auction. Step 2. Fill in the DPW Auction form that opens. When you create a DPW Auction, you will be telling DPW at what amount do you want bidding to begin, when the auction will start, and how many days you want the auction to last (between 3 and 7). You also specify at what time you want the auction to end. Pick a time you believe is convenient for the majority or your buyers. Then, tell DPW how many times to automatically re-list (restart the auction) when the auction ends without a bid. You can choose zero to three times. After the third time, you can manually re-list an auction on your my Auctions tab for 50¢ each additional relisting. If DPW didn't pull or you didn't upload a high resolution image (read this article), then you can upload one in the auction form. As explained in the help article, the image file size should be smaller than 1 megabyte (mb) with a resolution, to enable the zoom feature of 600 to 1,000 pixels tall or wide. Once you do upload a high resolution image, or if you already have one in DPW, then a preview link will appear that you can click to preview the zoom effect. You can also upload an optional additional image of your painting, which will appear on the auction page for your buyers to view. Most often this is your painting in a frame, to give buyers an idea of how it would look. There is no need to upload a close up of the main image, since that is what the zoom is for, if you have uploaded a high resolution image. The zoom feature and preview link work the same for the additional as with the main image. The auction form is a long form, so be sure to scroll down as you fill it out. Finally, when done, click the Submit button. If you have missed filling in any required values (fields with red outlines and * in the label) then an error message will appear. Read it carefully since it will tell you what information you are missing. When all errors are corrected you can click the Submit button again. If the Start Date for your auction is today, then it will begin immediately. Otherwise it will begin on the day you selected. When the form is completely filled out and before clicking the Submit button, you can click the Save as Template button, if you like, which will save the current form values as a template for all new actions. This is for your convenience. You will be able to change these values, as needed. As with the Submit button, an error message will appear if you have not filled in all the required values. When selling a painting through a DPW Auction, do not fill in the Price value in the Art Tracking grid for the painting. DPW will automatically populate this value with the highest bid, as bidding progresses. When your painting sells, DPW will mark it as sold. DPW Auctions use your PayPal Account that you specified when you set up your PayPal checkout. DPW manages the auction and bidding, however the transaction is only between you and the buyer. DPW bills you once each month for any auction listing and commission fees. DPW creates a PayPal button for you, which will be available to the winning bidder both on the auction page and in the email they receive when the auction ends. Unlike eBay auctions, DPW Auctions do not have a reserve price, which is a hidden minimum bid that has to be met before the auction ends in a sale. The reason for this is reserve prices are not very buyer friendly. The goal of a reserve price is to pull buyers into bidding, but then hides from them the actual minimum bid required for them to win the auction. This can be very frustrating and feel manipulating and so DPW Auctions do not offer a reserve price feature. Instead, be sure to set your auctions starting bid to no lower than what you want to sell your work for. You can read more about DPW Auctions here. Posted - Sun, Jun 12, 2011 at 10:11 AM. This article has been viewed 20914 times.